Sure, we’re still in the dead of winter, but I can’t help but to think about warmer days ahead. Today is the first day that the sun made an appearance in over a week, so I’m in a springy kind of mood! I can smell…almost taste…the warm, spring air despite the frigid reality that awaits outside my door. In case you forgot one of the most important cold-weather holidays, Groundhog Day, is in just three days. And as we wait with baited breath for Punxsutawney Phil (or Buckeye Chuck for Ohioans) to tell us whether or not we’ll have six more weeks of winter, I’m already thinking about what kind of freshness I will conjur up in my home with a few gallons of paint, new fabrics, and a good cleaning of all surfaces. By the way, regardless of what either rodent has to say, spring will arrive on March 20 at 7:21 P.M. EDT. With a lot of help from my personal cleaning brigade (A.K.A. husband and children), I’m looking forward to being able to clean every window, open every set of blinds and curtains, let in outdoor air through every door and window, clean or replace floor coverings, purge or donate piles of now-unwanted goods, and plug in the season’s sweetest air fresheners. That spells spring to me! So when will this spring cleaning plan of mine launch? It depends on when the weatherman believes we’ve had our last snow of the season. When do you start spring cleaning? 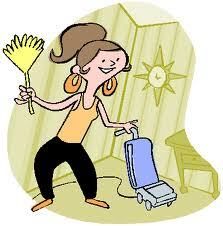 What are some of your spring cleaning rituals?